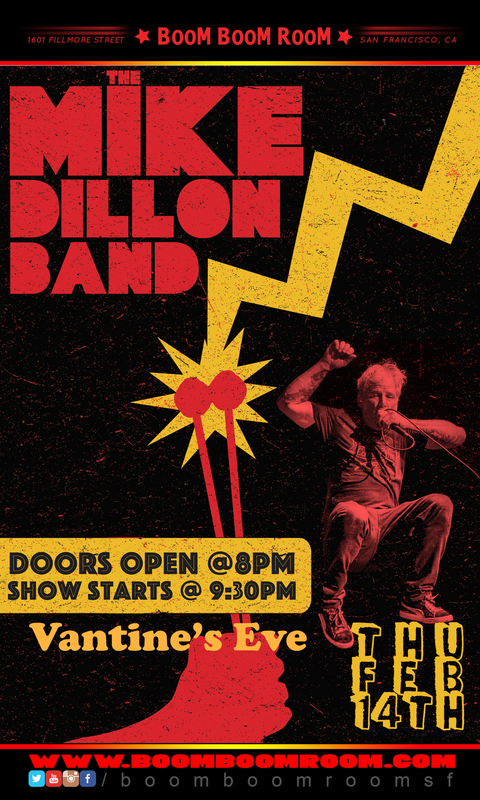 MIKE DILLON BAND ~ "Valentine Punk Funk Rock Vibes"
The Vibraphone Destroyer is back, doing what he does best, playing amazing percussion, especially with his mallet instruments. We’re talking, of course, about Mike Dillon, who just got back from a brilliant Jam Cruise with more amazing sets than you can imagine, including truly spectacular sets with Galactic and with The Porter Trio, as in George Porter, Jr.
"Thanks to all the peeps and musicians on the Jam Cruise. What a great way to get the year rolling. Now I will lay off Congas and Bata for a while and focus on vibes and tabla." 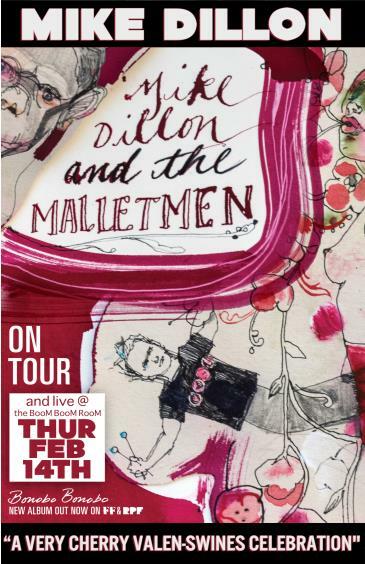 There’s a very good reason Mike Dillon is known as the “punk jazz provocateur.” Come find out why. How many artists have been praised a “punk rock provocateur,” “jazz vibraphone visionary,” and “percussion virtuoso” in the same sentence? There’s only one: Mike Dillon. Whether through his affiliation with artists like Les Claypool, Primus, Rickie Lee Jones, and Ani Difranco, or collaborations such as Nolatet, Garage a Trois, The Dead Kenny G's, Critters Buggin or bands he has led, including Mike Dillon Band, Mike Dillon's New Orleans Punk Rock Percussion Consortium, Billy Goat and Hairy Apes BMX, the Texas-native has set his own standard for 25 years now. In 2016, the Gambit's Big Easy Awards named Mike Dillon "Performer of the Year" and the Mike Dillon Band "Best Punk/Metal Band" in New Orleans. Living in New Orleans for over 10 years now, when not on the road with Rickie Lee Jones, Nolatet, or the Mike Dillon Band. Since breakout 2011 release In Light, GIVERS have embraced a vision of life and love that, in the band’s early years, bubbled with the optimism of unchallenged youth. Ever the disciples of movement, GIVERS channels Afro-pop polyrhythms and art rock collage into raw, transcendent joy. Now each in their early 30s — ragged, accomplished, philosophized — the band’s creative nucleus of Taylor Guarisco, Tif Lamson, and Josh LeBlanc has transitioned from celebrating life to probing its complications: the cruel fiction of unmet expectations, the deflation in opportunities lost and the elation in new ones found. In the process, they left the place of the band’s birth (Lafayette, La.) for the cultural kaleidoscope of New Orleans, now the site of their coming of age.